wow, I can't believe you have this photo posted. I went to St.B and I missed those old fun day joing the marching band. We praticed in the football field every Wed and Fri evening, if I remembered correctly. All, there are store next to the St.B at Block 16. Thank you for sharing and please continue to post if you found any others St.B photos. This old photo was shot around the end of 70's or early 80's, the golden age I guess. A good place for noon shift students copying homeworks was rooftop of block 14. School sloping backyard had a lot of tall bamboos but restricted area for students. Gound floor had a st.Joe statue on the altar, left and right hanging with traditional chinese dark ash dragon lanterns, second floor had a Ave Maria statue, and 50 gallon aquarium tank aside, with green light flooding. Shool band name's silver, instructor nickname dubbed as tortoise, cause his last meant money. A open basketball court was for assembly purpose, kids must stand there at least 30mins for regligious or school discipline before class. Some buddies frequently got rewarded with corporal punishment, such as caning or twisting ears for no cause, and older pupils' prefect had right commanding his peer. Being a teacher pet was the No.1 commandment, all folks notching in mind. One of group activities held on Sat was Chinese calligraphy. God bless you all, amen. what's a filmsy and blurred revive. I am so glad to see the photo, have any more??? Thankyou! 哈哈哈 ... 我好開心見到有呢個 blog, 好開心有咁多慈雲山舊街坊o係E道聚舊, 不過最開心都係見到呢張聖文德小學o既 post card 相, o係E道撞返咁多聖文德小學o既師兄弟姊妹o添! 仲見到我舊居呢! 我好似係七九年畢業 (6B班), 當年係讀下晝班o既! 我阿哥大我一年都係讀 St. B 下晝班, 佢早我一年畢業o既! 我都記得我同我阿哥D冬季校褸運動衫褲白飯魚係幫襯源興祥買o既! 我好鍾意我o地套夏季校服, 白色加天藍色o既海軍 服, 我o地個個都著得好醒目有型, 不過我就唔鍾意我o地所有女同學都要剪到成個冬菇湯碗頭咁 leung 爆! 蔡美莉, 蘇XX, 張君卿, 劉美鳳 <-- 以上呢幾位 miss 都做過我班主任, 洗潔精 (冼潔貞) 教過我數學 & 美勞, 謝佐芝教過我聖經 & 美勞, 周珍賢教過我中文 & 聖經, 譚XX (miss) 教過我數學 & 聖經. 謝佐芝,陳妙珠 & 區XX (好矮小o既 miss, 我唔肯定佢係唔係姓區, 只記得佢係6A班主任) 就做過我阿哥o既班主任. 我好憎黃玉兒 & 有個阿 sir (唔係陳學庸呀! ), 因為黃玉兒成日 un 腳, 個樣又串又剋人憎, 而果個阿 sir 就成日 liu 鼻屎, 核核突突樣衰到爆! 我記得我二年班果陣時有個姓區o既男主任, 佢好似同我o地個黎緯德女校長結o左婚 (我唔係好肯定係唔係), 當時 St. B仲有個張神父o添o架! 不過張神父唔係成日o係 St. B 出現. I studied in S.B between 1966 (P2) and 1971 (P6). Mr KWOK Kin Wah was my class teacher of 6C when I completed my primary schooling in 1971. Many of the SB teachers of my old days may have passed yet they live in my memory. 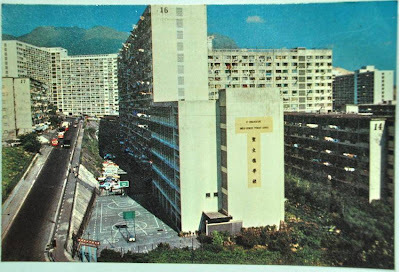 Of the 1971's 6B classmates, I still keep contacts with CHEUNG Kwok Fai, LI Chi Keung, FUNG Kwok Wah, LEUNG Kam hung, HO Wai Yuen and AU YEUNG Lai Wan, a friendship that has been lasted for more than 40 years with them. 多謝你回覆我個留言呀! er ... 唔好意思! 我對你個印象有D模糊呀! 可能你係 79年 6C班畢業o卦! 但我應該同過你同班, 只係我唔記得係小一至小四邊一年同班囉! 你之前講o既果一堆同學呢 ... 我只對何玉鳳 & 麥雅秋呢兩個名字有些微印象, 但你o地三位個樣貌我已經唔記得晒 lu! 6C班我最記得有區再明同埋陳錦輝呢兩個男同學, 6A班我就記得有鄧鶴宜 & 李念慈 & 李美鳳, 至於 6D班o既同學我就完全唔記得有邊個喇! 無錯! 你講得o岩, 梁浩達屋企係賣生果o既, 佢同文豔芳都係住沙田村, 佢兩個放學之後係搭校車返屋企o既! 梁浩達 & 魏永和算係高大o既男仔, 據我所知佢兩個男仔果陣時好鬼死 friend o架! 點解我會記得區再明 & 陳錦輝呢? 皆因佢o地兩個同過我班果陣時係坐過我隔離o既! 至於鄧鶴宜呢 (佢係男同學o黎o既!) ... 當年佢係風紀隊長o黎o架! 我係副風紀隊長, 所以我對佢好有印象, 至於李念慈 & 李美鳳兩位女同學都同我一樣, 中學去o左德愛讀書, 李念慈佢好有體育細胞, 佢運動比賽成績好好, 佢o係德愛讀完中三之後, 轉o左去第二間中學讀書. 阿李美鳳佢呢 ... 哈哈哈 ... 自從中一開始我就同佢好熟落, 我成日上去佢屋企玩 & 做功課, 到中四中五佢讀中國文學, 而我讀英國文學, 所以唔同班, 就開始冇之前咁熟落, 一來唔同班, 二來係因為功課多 & 測驗考試多又忙, 中五之後就各散東西 lu! 講返D班主任呢 ... 哈 ... 對我o黎講都幾奇怪o架! 點解我會咁講? 因為有幾個 miss 班主任唔係因為大肚要生BB 就係因為重病就大半年唔見到佢o地o架喇! 你話陳學庸呢個主任好鬼惡死 ... er ... 哈哈哈 ... 我由小一到小六佢都冇教過我任何一個科目, 而且係佢o係我讀五年班果陣時無端端揀o左我做副風紀隊長o架! 佢冇鬧過我亦都冇打罰過我, 所以我對佢有好印象o架! 不過我都聽聞佢罰過好多男同學囉! 但我真係好憎黃玉兒 & liu 鼻屎果個阿 sir, 佢o地兩個正一係賤精教師 (教師之中o既敗類), 佢兩個鬧 & 罰學生會令到D學生冇晒自尊. 至於你講St.B. 小學六樓女廁長期關門唔用得係事實, 佢有冇真係有鬼出現過我就唔知道, 但我都知道有人傳過果道鬧鬼 (得個"傳"字囉! ), 其實我覺得St.B. 小學有好多層樓 & 課室都好暗好陰深幾恐怖果種感覺, 果陣時我返學都驚驚o地o架! I studied in S.B. between 1966 (P2) and 1971 (P6). Mr KWOK Kin Wah was my class teacher of 6C when I completed my primary schooling in 1971. Many of the SB teachers of my old days may have passed yet they live in my memory. Of the 1971's 6C classmates, I still keep contacts with CHEUNG Kwok Fai, LI Chi Keung, FUNG Kwok Wah, LEUNG Kam hung, HO Wai Yuen and AU YEUNG Lai Wan, a friendship that has been lasted for more than 40 years with them. At the ground floor of Block 16, next to the school, there was a barber shop. My father used to work there. Next to the barber shop is a store, where they sell clothing, underwear, shoes and stationary. I remember buying hats there for school picnic and also German made compass (for math). This little store sells a lot of good quality stuff. Near the middle of Block 16 is a food store, where I used to buy 1/4 loaf of white bread and Coca Cola. My classmate is the son of the owner. The owner passed away while the son was young, and my classmate's mother had to work so hard here hands were thick with callouses. I just find this blog and I am also a graduate from St. B...I believe I stuided there from 1966 to 1972 but not 100% sure! I cannot remember the name of my classmates except 鄭厚君. She is the oldest daughter of 周珍賢老師. We used to be very good friends but being disconnected after graduation! Mr. 陳學庸was my Class Teacher of P.5. We had a very sincere and beautiful English teacher but I cannot recall her name!!! Anyway, she is very exceptional. 謝佐芝 sounds very familiar. I wish I could meet some of our teachers if possible! 我就81年入小一讀到中七, 我記性麻麻, 但係睇到呢個Blog, 真係令我諗起細個好多嘢. 今晚突然想起周珍賢老師, 就上網找找,竟然搵到這裡. 講惡老師除咗陳學庸老師之外, 仲有古集文老師, 身形龐大, 我見過佢打斷唔少間尺, 係木間尺, 見到佢已經怕. 她任教聖小長達三十年, 由16座落成至搬往新校兩年後便退休; 早幾年她患上癌疾, 去年＋一月與世長辭, 回歸天國. my recall blurred but I think your name is Au Yue Wah . As me is one of most notorious students at that time. 唔好意思各位，我是住在鳳凰村，環鳳街的人!! 大家有無印象這條街呢?大家有無六、七十年代時環鳳街的照片呢? 其實佢係幼稚園聖西滿附近，有無係聖西滿外出影過相呢? 如有，可否比我? 如有請留言,我會給你e-mail.謝謝! 我是1981年下年校畢業的. 剛剛又翻開珍藏多年的畢業生記念冊. 仍然保留有一些當年畢業的同班同學焄片. 其中有一位我當年很混熟的舊同學(經常相約到他家裡下棋, 或打球), 現在您們可能都會看到他間中上電視, 領導保護維海行動的那位 李姓律師DENNIS. 我太太十分奇怪不相信, 我隨即馬上打開記念冊, 再開網上的一些訪問短片馬上確認! 我當年雖然不是住慈雲山(住鳳凰村, 我現在還可以回到舊居, 亦有不少機會重遊慈雲山. 當年我亦很善歡到觀音廟,獅子亭, 或與鄰居到山上放紙鳶..或跟同學到雜貨舖打機, 租康樂棋打, 所以我對慈雲山亦有相當感情. 有沒有 認識我 何興X 的 ?? Please visit our facebook page: 聖文德小學1981畢業生 !